It can be described as a war of independence; a rocky road of arguments; a roller-coaster of emotions, epidemic tantrums and an era of silence. Welcome to the world of tricky teens! The adolescent years can be highly distressing for both parents and teens alike, while the art of raising teenagers and remaining sane can be curiously elusive in today’s society. Tricky Teens: How to create a great relationship with your teenager without going crazy! is an insightful parenting tool to help parents safely navigate and survive these challenging years. Author and clinical psychologist, Andrew Fuller, says understanding the ‘neurochemicals and hormones washing around in the massive soup bowl’ of the teenage brain, can be lifesaving and sanity preserving. Learning how to parent in ways that manage turbulent mood swings; addressing anxiety and busting worry; having the teenage brain explained; understanding the patterns of arguments; learning the art of communication and becoming better at loving your teen are just some of the topics covered in this valuable resource. Fuller also stresses the important distinction between teenage boys and teenage girls; outlining the differences between the ways they think and develop and offering essential advice specific to each gender. In a world where parenting is the biggest and, at times, the toughest job there is, Tricky Teens is an easy to read step by step guide for any parent. Designed to help create and nurture open and solid relationships between parents and their adolescents, Tricky Teens will leave you inspired and encouraged. For anyone raising a teenager, this book is definitely worth the read. 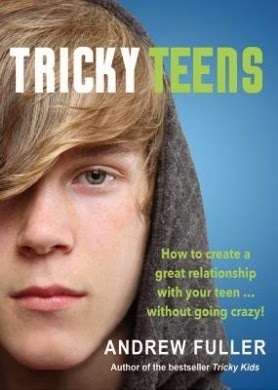 Title: Tricky Teens: How to create a great relationship with your teenager without going crazy!